This past weekend rolling crates filled with halogen lamps, Ikea, and Bed Bath and Beyond furniture swarmed the campus. That's right, another generation of Penn (2,500 Freshmen!) moved into Penn! Per University Communications, "Students in the Class of 2015 come from 49 of the 50 states and 66 countries. The largest numbers of students come from Pennsylvania (403), followed by New York (279) and New Jersey (423)." Shocker! Further, "some of the nations represented by students in the freshman class include Australia, China, Panama and Zimbabwe." 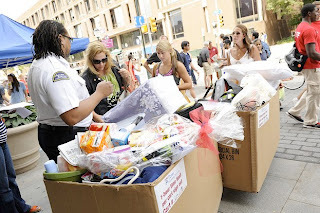 After the jump, check out a slideshow of photos from this weekend's move-in and share what one item was key in your Penn past to setting up your freshman dorm room! Out of everything you brought, what one item was key to setting up your dorm room? Comment below!